Could this be a new Cirrus 2 Seater? The internet is abuzz with gossip of a possible new entry in the Cirrus Aircraft line of airplanes. It seems like the famed manufacturer is possibly producing a smaller variant of it’s hot-selling SR-20/22 line of aircraft. Though this picture is grainy and potato-quality, it gives us something to go on. While this picture doesn’t necessarily prove that this model is too much smaller than a traditional SR20, it’s possible that this plane is something new for the lineup. 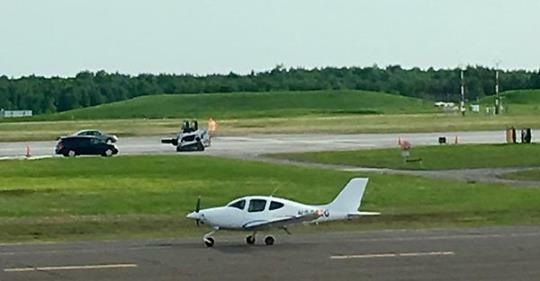 PilotsOfAmerica user zeitcev notes that “the wing is relocated further forward relatively to the cabin, probably because there’s less airplane behind the front seats. The windows are a little different and the tail is very different. In particular, the horizontal stabilizer is moved to the tip of the tail. The nose gear is also different” though he admits that it’s hard to tell for sure from the low resolution picture. Reddit user u/winged_warrior claims that the “FAA Registry shows it as an ‘EX18’. Maybe its an SR-18?” he speculates. Regardless of the truth behind these speculations, it’s clear that the Internet is interested in a new model from Cirrus. The manufacturer is known for beautiful planes that are safe and fly fast, so a smaller more affordable alternative would be welcomed by the flying community. PilotGear.net is a participant in the Amazon Services LLC Associates Program, an affiliate advertising program designed to provide a means for sites to earn advertising fees by advertising and linking to amazon.com. © 2017 by PilotGear.net.